Two can play that game // Where's the driver drama hiding in 2016? These few months leading up to 2016's Formula One season have felt intensely quiet, far more peaceful than usual, with just a couple of surprises and news items to keep eager fans satisfied. There's been talk about engine changes and potential cockpit cover designs, sneak peeks at new machinery and testing just getting underway, but for someone like me, there's not a lot to grab hold of as the new season draws closer. I prefer the rich narrative that F1 brings, rather than the technical details, which means keeping an eye on paddock movements, perusing the team launches for insight, and more importantly, analysing driver decisions and changes for a brand new year. 2016 has been incredibly lacking in terms of exciting team launches and gamechanging driver decisions. Given the current environment, it's understandable that flashy launches are a thing of the past, but I hadn't expected this level of apathy with less than a month to go to the first race. It's not a surprise that schedules may have been pushed back given the late finish to last year, but it does mean that so far we're heading into pre-season testing more blind than usual. What has really struck me ahead of the 2016 season, however, is how consistent teams have been with their drivers, meaning there is little to grab hold of and chew over. Where are the "how's Alonso going to cope at McLaren?" type situations, and the "What is Hamilton thinking moving to Mercedes?" questions. The changes that have taken place this year were either signalled a long time ago, or have been predictable to say the least. It seems like a long enough list but they involve an awful lot of the same people, and when you look at the rest of the grid there's an amazing amount of stability. Mercedes aren't changing what's broken with their driver lineup, Williams are continuing to push their solid duo for bigger and better things, even Ferrari haven't managed to give Räikkönen the boot yet. Despite an entry list that looks remarkably similar to 2015, there are still driver stories that I'm excited about. Here are five of them. I can't begin to imagine the number of meetings that have taken place at McLaren and Honda about the big problems they've had integrating back together and creating a sturdy enough car to finish races. We all knew it would be a steep learning curve for the returning Japanese manufacturer and both drivers showed an enormous amount of patience whilst waiting for the good times to come. Unfortunately, they're still waiting. It's disappointing for us, because with McLaren trundling around at the back of the field, we are robbed of two extra F1 champions to take the fight to those at the top. These are two classy drivers, for the most part, and given a year of learning behind them, I hope McLaren will be able to provide them with enough machinery to make them entertaining rather than miserable this time round. Both these drivers, but Verstappen in particular, showed moments of brilliance last year. If there was an overtaking opportunity, however minuscule, Verstappen would go for it, and more often than not he would pull it off. Where more experienced drivers may wait for a better option later in the race, Max would seize the moment and get things done. The Toro Rosso duo both suffered from more than their fair share of bad luck though. Sainz retired from four races in a row between Austria and Belgium, whilst Verstappen found it very hard work to get his season going due to DNFs and unclassified finishes. The points finishes did start rolling in towards the end of the season, so if the team can keep up that momentum, I look forward to seeing these two going at it again. They didn't hold back from being competitive with each other, and with everyone else, last year and 2016 should be no different. Red Bull have a solid line up of drivers across their two teams, but I think we were hoping for a little more from the Ricciardo and Kvyat lineup. It's nice to have a Red Bull partnership that don't antagonise each other every step of the way, but perhaps that's what's been missing. A couple of podium finishes during 2015 show the team have potential but they also had plenty of races being swamped in the midfield. 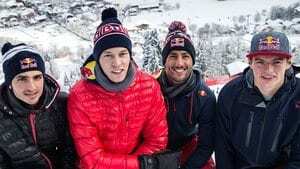 This has the potential to be another great teammate battle to watch - Ricciardo the next big thing at Red Bull desperately trying not to be shown up by the newer Kvyat. And both, of course, keeping a wary on Verstappen who's been turning heads every step of the way. As excited as I am about a new squad on the block, nothing about the Haas entry feels like it fits together to me. An American team with a French and Mexican driver, who have very little experience together, racing in cars powered by Ferrari. It seems odd. I was surprised when Grosjean flew the nest, but it was about time he split from Lotus (even if he has since said he'd like to go back, poor homesick Romain). It's going to take a while for the two drivers to gel together, I suspect, but at least they are doing so in a team where everyone is the new kid. We mostly know what to expect from Grosjean - given the power and the right conditions he can be a brilliant driver. If things are slightly awry, it can slip away from him very quickly. With Esteban, we didn't really have time to get to know him that well. Two years in an underperforming Sauber did nothing for his CV, and he's lucky to have the Ferrari connection giving him another shot. I can't wait to see how these two perform this year. Talking of the Swiss team, we've seen very little of late to make us believe they've turned a corner. Granted, I didn't see as much of the 2015 season as I would have liked, but I can't be the only one that often forgot Sauber were in a race. That being the case, it would be nice if Ericsson and Nasr could have a bit of time in the spotlight, just to see if they're up to it. Or just to see them at all, really. It does feel like 2016 is a carbon copy of its predecessor, but it doesn't take much digging to find some stories that are definitely worth keeping an eye on. Hopefully after the first few races, we'll have many, many more.